Meet Sarah Galante & Jaime Jarrett: Sarah and Jaime are the co-authors of this headliner show Hear Me War. It is a new indie-folk musical that addresses intersectional feminism. 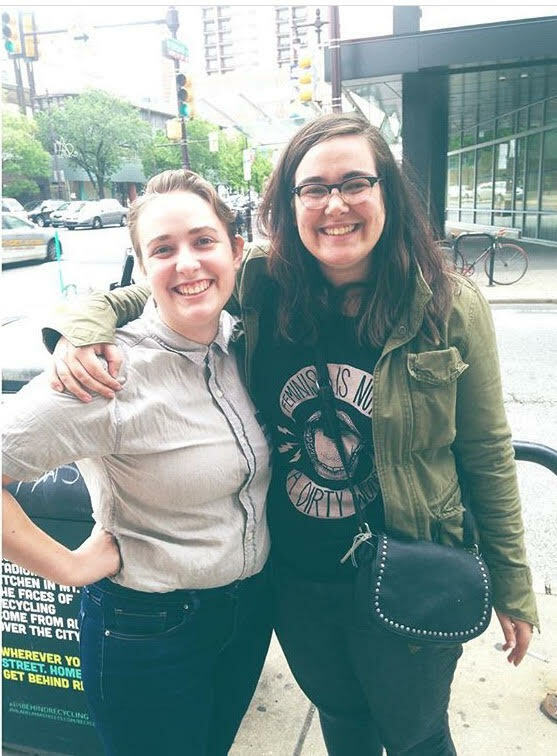 We caught up with Sarah and Jaime to discuss Philadelphia theater and collaborating on Hear Me War: a new Musical About Dismantling the Patriarchy. Sarah: I was a playwriting major at The University of the Arts in Center City. Being a theater major and living blocks away from some of the greatest theaters in the city was a great way to start to break into the scene. Also, the majority of my professors were working within the theater community and provided a lot of opportunities to get involved. Jaime: I studied theatre (with a focus in writing musical theatre) at The University of the Arts. I was completely surrounded by all kinds of Philly theatre artists making all kinds of work through all four years at UArts. When did you first begin writing plays? Sarah: I wrote my first play when I was sixteen. It was called “Tell Me About Your Week,” and was about a therapist and all of his patients. It was not very good. Jaime: My parents will never let me forget the awful “plays” I wrote when I was in elementary school. During my junior year of high school I wrote my first short play that I was actually proud of. It wasn’t a musical, but there was a piano in it! Sarah: The theater community is really close knit. I live in New York City now, and the theater community there is so competitive and harsh. There is something almost familial about the Philly theater community that I love. Jaime: For me, working on a piece of theatre (or simply seeing a piece of theatre) in Philly is a lot like walking down the street here. I’m almost always going to run into people I know and care about deeply. I’m incredibly grateful for that – I can’t imagine there are a lot of theatre communities like this one. What was it like collaborating on Hear Me War? Sarah: Is it cheesy to say a dream come true? Jaime is an ideal collaborator. He is patient, kind and knowledgeable. This was the first musical I’d ever worked on, and the first time I had collaborated with another writer on a project. I can’t imagine collaborating with anyone else. It helps to collaborate with someone you care about, I think. It helps us be honest with each other, and in turn care deeply about the integrity of the show. I can’t imagine this is the last time we’ll collaborate. Have I gushed about Jaime enough? Jaime: The first time Sarah and I collaborated was on a comedic song for a class that was-for a lack of a better word -scandalous. Sarah fearlessly brought me a hilarious set of lyrics, and we wrote the music together from there. There was an instant chemistry between us. A few months later, she brought me onto Hear Me War, and it’s been a dream ever since. That sounds romantic – but I do believe a collaborative relationship is a lot like a marriage. It takes work, but we both know we’re in it for the long haul. And I’m grateful every day for the silly song we wrote together a year and a half ago. What was has been the most rewarding and the most challenging part of this process? Sarah: The most rewarding moment I had was, funny enough, the day after the presidential election. All of the people I loved were feeling really defeated and small, and I had several friends reach out to me and tell me they had listened to some of the “Hear Me War” demos and felt stronger. That was huge for me. There is nothing more rewarding to me than feeling like your art is helping or healing other people. The most challenging has been continuing to write and develop this piece while feeling really defeated about the world we live in. Something I’m currently exploring in this draft of the script, is what it means to be an activist when you’re no longer feeling active, which is something I’ve personally been struggling with a lot this year. Jaime: The most rewarding is definitely the effect I see on people every time they sing, speak, or hear this piece. We’re lifting up voices that are not heard from enough. We’re taking experiences that are usually hidden away and putting them in the spotlight. When someone identifies with a song from the show, I feel like we’re doing something right. The most challenging part of this process is heavy with gender politics and queer-ness. As a trans guy, I have a pretty loaded relationship with femininity. I want women to feel empowered to say “I am a woman and I won’t apologize for any part of that.” But for me, people told me I was a woman for most of my life, and that’s simply not my truth. I’m never going to be proud of being a woman, because I’m not one. I’m learning to navigate my way in a room that is woman-centric, while staying true to myself and not taking away from this much-needed space. I’m still figuring out where my place is – I know I belong in the feminist community, I’m just figuring out exactly where I fit. And the team of Hear Me War is an incredibly supportive community to figure that out with! Which female artist inspires you the most? Sarah: Oh my God, it’s impossible to only pick one. Right now my top five are: Lynn Nottage, Paula Vogel, Kathleen Hanna, Jackie Sibblies Drury and Michaela Coel. Jaime: I’m gonna have to go with Alison Bechdel. My queer heart would not be beating the way it beats today if it weren’t for her graphic novels and comics. Sarah: I can’t wait to see new work by female playwrights! Nothing inspires me more. Jaime: Women’s voices are simply not heard enough. I’m so ready to get to see more female driven art! There’s so much great material out there created by women, and I’m so glad that this festival aims to life up their voices. Looking for a festival pass to PWTF this August? Get one here or click here to donate to the great cause.